Peter Rabbit is hopping onto a brand-new DVD collection, Peter Rabbit Springtime Collection 2-Pack, available February 5, 2019. This special two-disc repackage features Peter Rabbit and Peter Rabbit: Spring Into Adventure!, and is jam-packed with fluffy fun-filled tales. Fans can watch as Peter Rabbit and his friends spring into action for exciting farm and seasonal adventures. 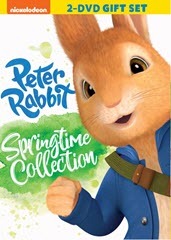 Produced by Nickelodeon Home Entertainment and distributed by Paramount Home Media Distribution, Peter Rabbit Springtime Collection 2-Pack will be available on DVD February 5, 2019 for the suggested retail price of $9.99. Peter Rabbit: Spring Into Adventure!